The WHO ‘Five Moments for Hand Hygiene’ adds value to any hand hygiene improvement strategy. Quite simply, it defines the key moments for hand hygiene with a view to overcoming misleading language and complicated descriptions. It presents a unified vision and promotes a strong sense of ownership to each staff member. The ‘Five Moments for Hand Hygiene’ not only aligns with the evidence regarding the spread of infection but it is interwoven with the natural workflow of care and is designed to be easy to learn, logical and applicable in a wide range of settings. 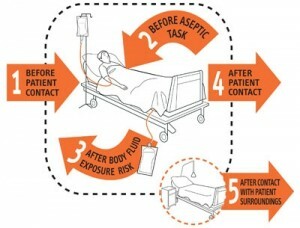 The illustration shows the WHO, Five moments of hand hygiene. Hand hygiene includes washing your hands with soap and water and/or cleaning your hands with an alcohol based hand rub. In 2011, Blackrock Clinic started measuring hand hygiene using the national Health Protection Surveillance Centre (HPSC) audit tool. This allows our compliance rate to be benchmarked against other hospitals inIreland. All healthcare provider groups including physicians, contracted employees and students are included in the audits. Why is measuring hand hygiene compliance so important? Hand hygiene is internationally accepted as the ‘single most important method of infection prevention and control’. This hand hygiene indicator measures healthcare workers compliance with hand hygiene in Blackrock clinic and benchmarks against other hospitals inIreland. This allows us compare our compliance rate between the hospitals and share ways of trying to improve hand hygiene on a national level. This measure also increases clinical staff awareness of the importance of hand hygiene. Always remember that hand hygiene is the ‘single most important factor in preventing avoidable illness, such as, health care associated infection (HAI). Wash hands when are visibly contaminated with dirt, soil, organic material. When entering and leaving the hospital. Before and after all patient contact. After moving from a contaminated to a clean area after contact with an individual patient. Before and after removing gloves. After personal bodily functions such as blowing nose and using the lavatory. REMEMBER ! CLEAN HANDS SAVE LIVES. We ask visitors not sit on patient beds, please use chairs provided. We ask visitors not to toilet infants or change infants nappies in patient room. We ask visitors not to use the patients toilet but to use the visitors toilets on the ward or in reception area. Children are not permitted into the ICU department (unless under special circumstances).